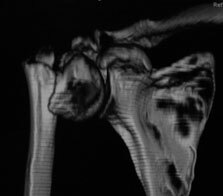 A fractured neck of humerus is a common injury of the upper limb. There is a wide rand of potentially suitable treatments for a fractured neck of humerus, which depend on the type of fracture and the activity level of the patient. Most fractured neck of humeri can be treated non-operatively, with a supportive sling for 3 to 6 weeks. During the time that the patient wears the sling, it is important that (s)he comes out of the sling to practice hand, wrist and elbow exercises to prevent stiffness from setting in. From 3 to 6 weeks the patient can usually commence some shoulder exercises, ranging from gentle pendular exercises to assisted forward elevation. Some fractured neck of humeri may need an operation. This is usually the case if some of the bone fragments, namely the tuberosities are widely displaced from the rest of the head of humerus. The most common operation performed for a fractured neck of humerus is fixing the bones with plates, screws, and sutures. Other potential operations include humeral nails, half a shoulder replacement (hemiarthoplasty), or rarely a reverse shoulder replacement. Regardless of the form of treatment, stiffness is a very common problem after a fractured neck of humerus. A prolonged course of physiotherapy is usually required to assist in regaining a functional range of motion. The shoulder will generally continue to improve for up to 1 year after the fracture.